After an early battle of field goals, Indianapolis would score the game’s first touchdown on a QB Jacoby Brissett pass to TE Jack Doyle. They would lead by 4 points going into halftime. Colts edge defender John Simon opened the third quarter with an impressive interception return for a touchdown. However, the Titans kept the game close with field goals until they finally pulled ahead late in the fourth quarter, including QB Marcus Mariota touchdown pass to Taywan Taylor that put the Titans ahead for good. The Titans went on to win 36-22. With that, we give you our PFF exclusive takeaways from the contest for each team. While Murray’s numbers will be out shined by Henry’s after his huge (and essentially meaningless) touchdown, it was actually Murray who finished with the higher grade. Despite gaining just 40 yards on 12 carries, Murray made some key plays, picking up multiple first downs. He forced two missed tackles and gained 33 of those yards after contact. He was also huge in the passing game, catching all four targets he saw for 47 yards, 32 of which came after the catch. While it was clear that Mariota was not at full strength in this game, he still showed that he can be a good quarterback even without the aid of his legs. Impressively, it was when Mariota was under pressure that he really shined. On pressured plays Mariota completed 7-of-8 for 145 yards and a touchdown, compared to going just 16-of-24 for 161 yards and an interception when in a clean pocket. Mariota completed all eight passes he attempted when he was blitzed as well. Casey may not have had a great impact on the stat sheet but he was a menace all night for Colts center Ryan Kelly and his 31.9 pass-block grade reflects that. Casey finished with a run-defense grade of 79.2 as he recorded two stops. His pass-rush grade of 84.1 was tops on the team, as he produced three hurries and one hit. Casey has been playing well of late and has 18 pressures in his last five games. After surrendering an early reception to Colts WR Kamar Aiken, Ryan shut out opposing receivers for the remainder of the game. He was targeted four times, giving up the one catch for seven yards while also breaking up two passes. Ryan has limited opposing receivers to 201 yards on 26 targets so far this season with three pass break ups. Monday Night was arguably his best coverage game of the season, and he had a coverage grade of 84.3. It was a decent first half for Brissett, as he was given time by his offensive line and made some impressive throws, one of which was dropped in the endzone by Donte Moncrief. In the second half he wasn’t as sharp, he was under fire often and made a few inaccurate throws. Under pressure he was 3-of-11 for only 34 yards while being 18-of-26 for 178 yards when given a clean pocket. Brissett didn’t push the envelope too much, as he only attempted one pass over 20 yards. Moncrief was Brissett’s second favorite target behind TE Jack Doyle, who struggled securing the football as he had a fumble and two drops. Moncrief was targeted six times, catching five passes for 67 yards, with 22 of those yards coming after the catch. Moncrief has had a slow start to the season, only being targeted 25 times through six games and he’ll hope Monday night’s game will help Brissett build confidence in him going forward. His 1.97 yards per route run lead qualifying Colts receivers this week. While Simon will be remembered for his ridiculous pick six in which he reached up and plucked Mariota’s pass out of the air, he actually played well all game long. Simon picked up two quarterback hits when rushing the passer, and finished with two solo stops. 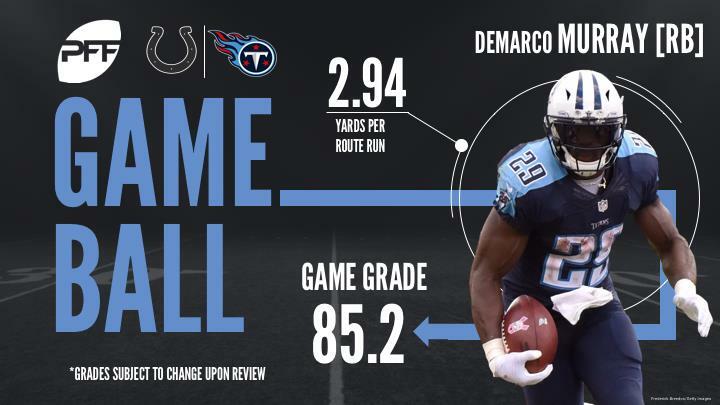 He was a disruptive force in the run game all night and gave the Titans’ offensive linemen fits trying to block him. He also allowed just one catch for five yards in 13 coverage snaps. Hankins was an unstoppable force in the middle for the Colts defense, constantly ruining running plays with his strong play. Hankins made two solo run stops, but that doesn’t do his impact justice. Titans running backs were constantly forced to adjust where they were trying to run the ball thanks to Hankins’ efforts, which is why he ended up with a run-defense grade of 91.0. Just for good measure, Hankins also added two quarterback hits when rushing the passer.